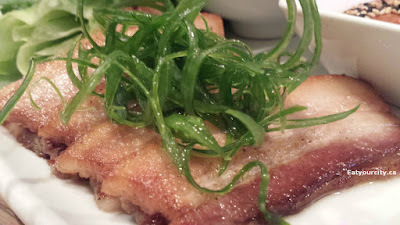 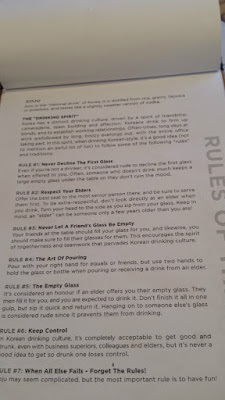 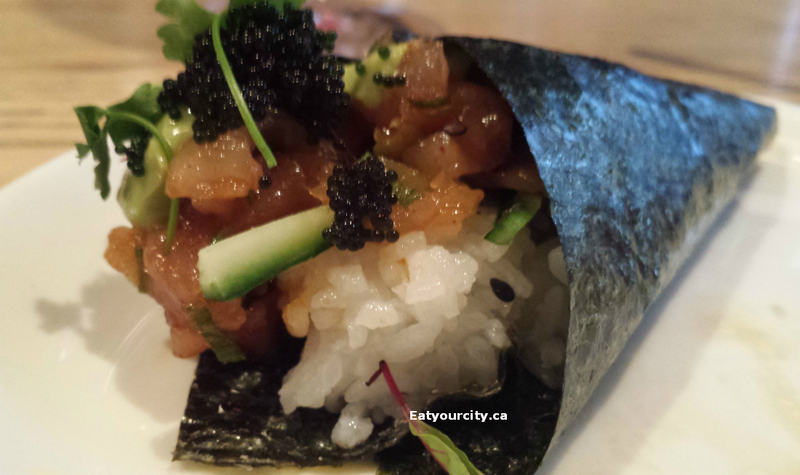 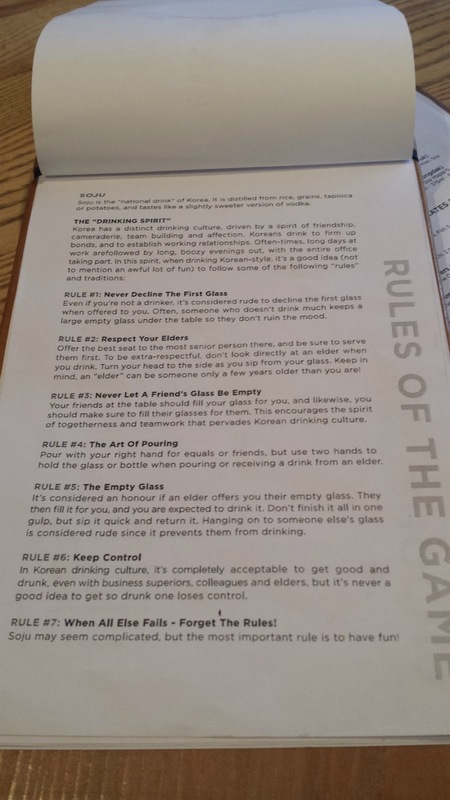 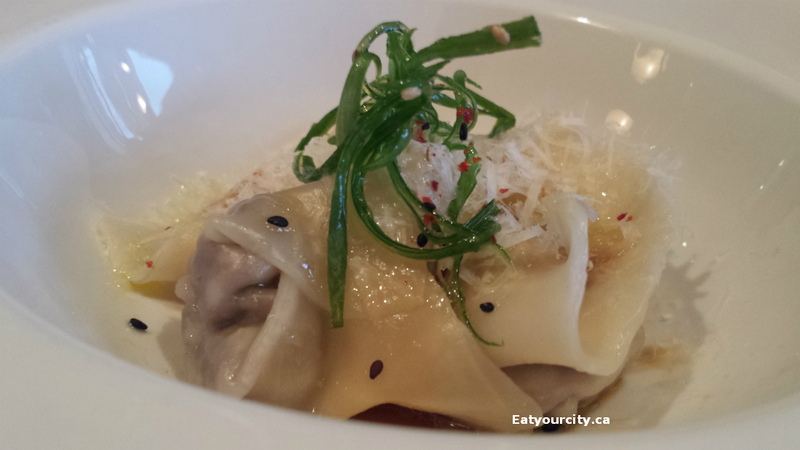 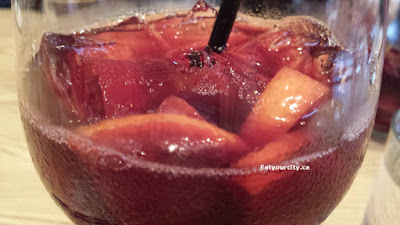 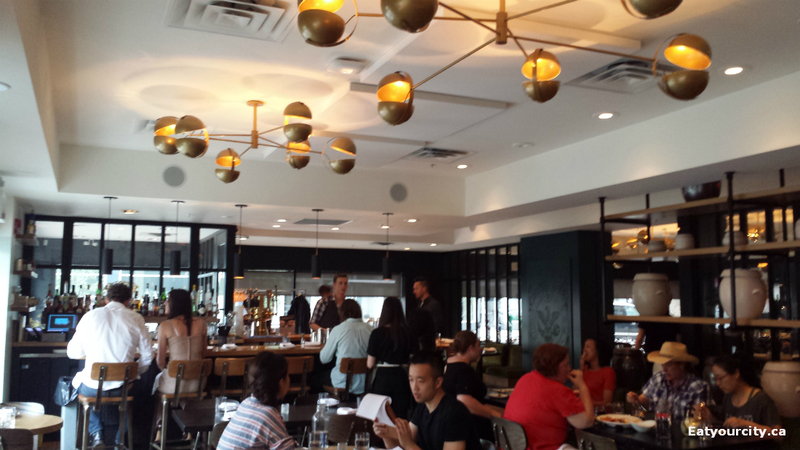 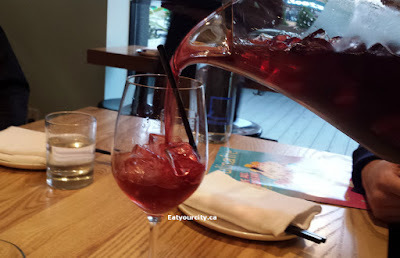 Eat Your City: Anju Korean Tapas, Calgary AB - great tapas, wine and more! 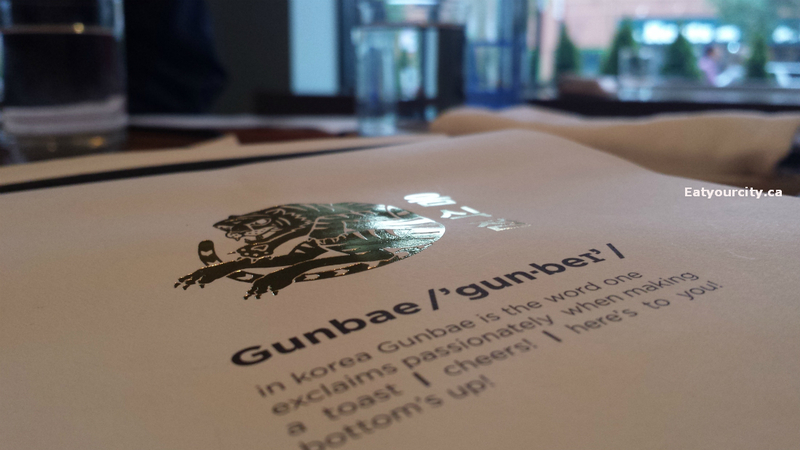 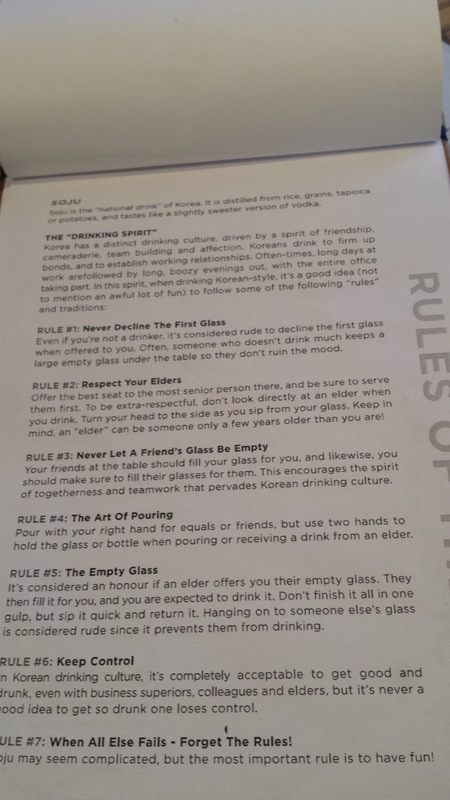 The Korean love of imbibing is showcased here and what better way than to tell folks how to say "cheers" in Korean right on the drink menu? And it was very yummy with plenty of berries and orange slices to add sweetness and citrus notes to the rich red wine base. 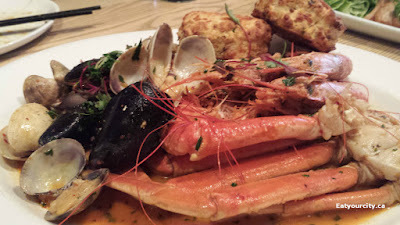 There are smaller and larger tapas available, and with a large table we were able to taste a good portion of the menu woot! The fare is a combination of Korean fused with Canadian and modern techniques, so here we go! 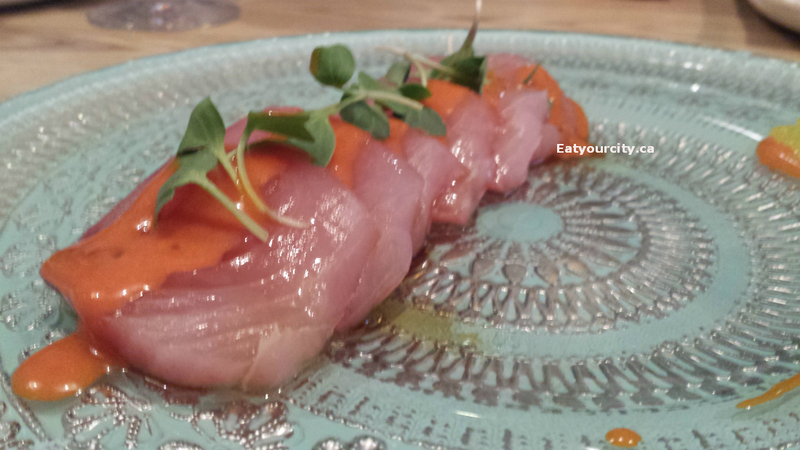 First item was a dinner special - Hamachi sushi with citrus siraccha based sauce, microgreens and ginger caivar. 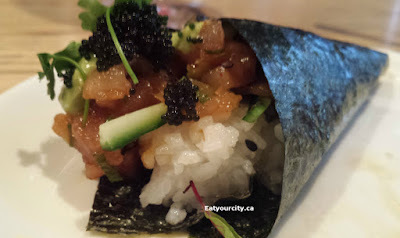 The hamachi was sweet and fresh, the sauce adding in a bit of heat and acidity without being overpoweringly spicy and the ginger caviar was a nice whimisal touch to the dish that added in a pop of flavor. 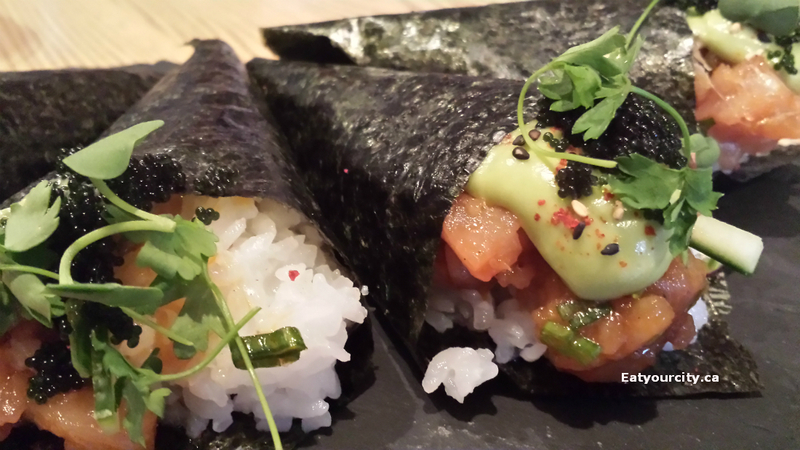 The Tuna Poke hand cones (Chamchi Kimbap) - avocado mousse, cucumber, sushi rice, tobiko, nori, was one of the favorites of the night. The tuna was cool and creamy, meshing well with an airy avocado mousse, a bright burst of unami and flavor from the tobiko, and the touch of salty black caviar was a nice touch. 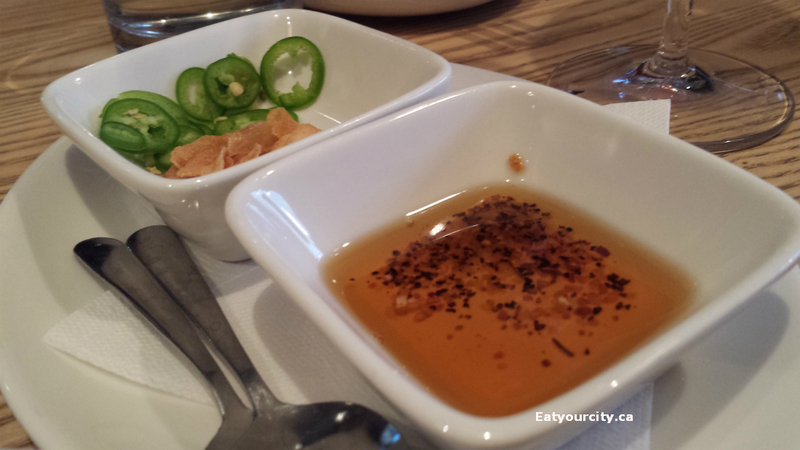 Next up was Poutine for your Seoul - cheese curds, Kabayaki gravy, fresh tofu, dehydrated kimchi. I admit, this is the first time any of us were eating poutine with chopsticks lol! The soft silken tofu bits was likened to soft cheese and the dehyrdated kimchi was a neat flavor to the poutine. 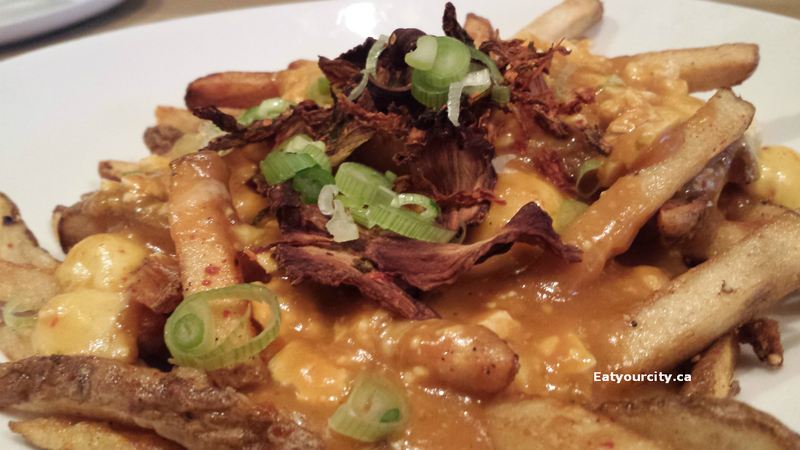 Would have preferred squeaky cheese curds, but otherwise a tasty poutine. 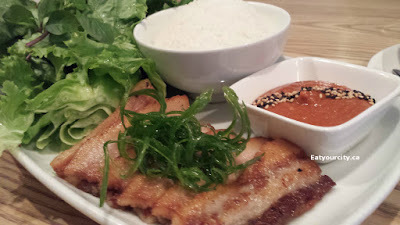 We really wanted to try the pork belly wrapped in a steamed bun, but that was only available on the set tasting menu and we had wanted to try a bunch of menu items that weren't on the tasting menu, so we'll have to try it next time. 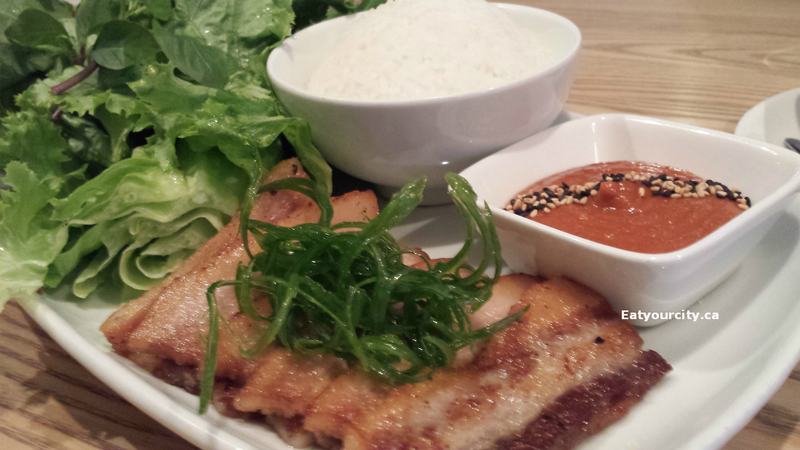 Instead, we had the Lettuce wraps (Sangchu Ssam) - choice of protein (we went with pork belly), Thai basil, ssamjang, garlic chips... and our protein choice was pork belly! 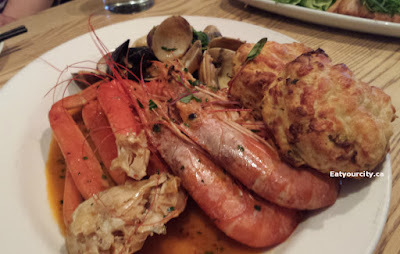 Rich, buttery, deliciously awesome is all I can say... a must try! The Hot stone rice bowl (Dolsot Bibimbap) - Choice of protein, assorted vegetables, Vita egg was also one of the favs of the night. 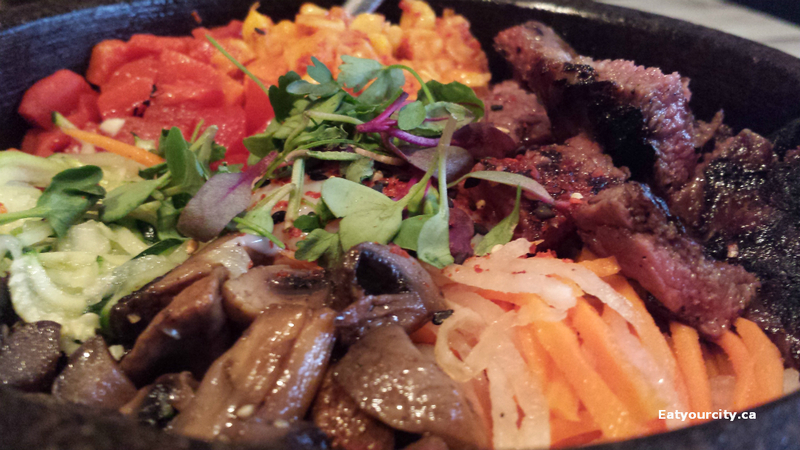 We went with beef as the protein source and it was a nice it of grilled sliced tender steak. 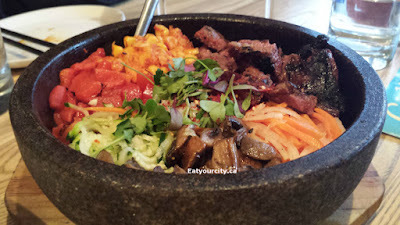 Lots of toppings on this traditional dish served in a piping hot stone bowl that crisped up the rice touching the bowl nicely. 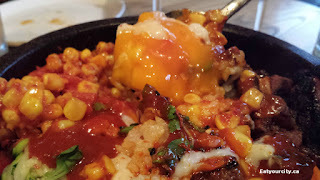 Add in the sweetened hot sauce and mix.. the raw egg yolk acts as a rich sauce as it tempers and cooks in the hot bowl of yum! We also had the Spicy Korea Seafood Boil (Haemui Jjim) - snow crab, mussels, clams, langoustines, kimchi cheddar biscuits. We were pretty full by the end of supper so shared the Frozen souffle - white chocolate, ginger, sesame brittle, mixed berry gastrique. 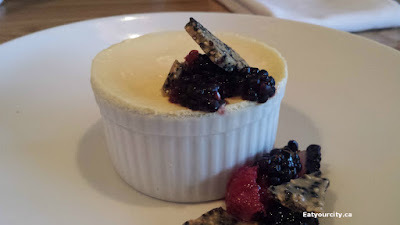 The white chocolate cfrozen souffle was more a cool mousse was flavored gently with ginger and was a nice light and tasty ending to a yummy dinner. 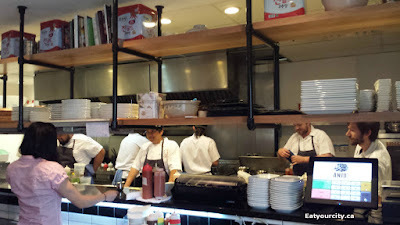 Overall, a welcoming atmosphere and interesting fusion of flavors, and techniques traditional and modern for tasty tapas and vino. Will be back later to try their tasting menu and their much talked about pork belly wrapped with steamed buns!